Roads are underwater in Fryeburg, Maine, after an ice jam on the Saco River. Incredible drone footage from the fire department in Fryeburg, Maine, shows River Street living up to its name — flooded after an ice jam on the Saco River Sunday. 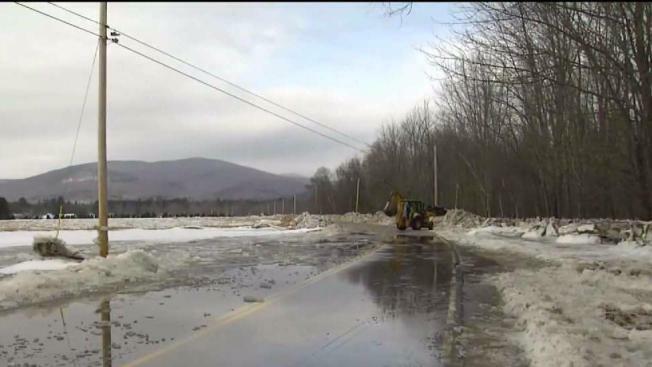 The floodwaters have been receding, but part of Route 113, which connects to New Hampshire, had been closed for three days. "It's phenomenal," said Michael Fougere, who lives on the New Hampshire side of the Saco. "It's the worst [flooding] I've seen in 23 years." He drives on River Street to get home, and he has had to take major detours while the road remained closed. According to Fryeburg Police, the road re-opened Tuesday afternoon. The fire chief's new concern is a repeat ice jam this week, as cold temperatures return, and mild weather is expected over the weekend. "The worst thing that could happen is if we get another real thaw and a lot of rain, and the whole thing lets go at once," said George Weston, who has lived by the Saco River his entire life. He said this ice jam is one of the worst he has ever seen.